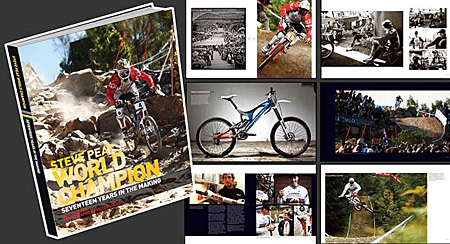 In this new book, Steve Peat gives an insight to his 2009 World Championship winning season. Through a stunning collection of photographs, we follow Steve from his winter training at home in Sheffield, through eight rounds of the World Cup series, where he set new records for the most World Cup race wins and podium appearances. Then another win at the Lisbon Downtown, before finally culminating with his victory at 2009 World Champs in Canberra. This is an underdog story to top all others, and it has been seventeen years in the making.